Sri Chinmoy is best known as a spiritual teacher, advocating a path of meditation and inner peace. However, when a knee injury curtailed his running career, in his mid 50s, Sri Chinmoy felt an inner command to take up the sport of weightlifting. From modest beginnings, he managed to rapidly progress to remarkable feats of strength. Sri Chinmoy’s weightlifting is a very visible demonstration of how inner strength can translate into tangible outer strength. 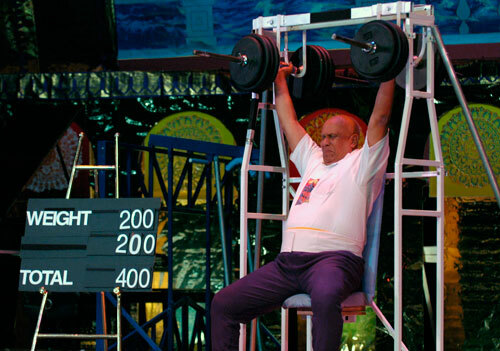 Many weightlifters who witnessed Sri Chinmoy’s lifts were surprised to see how he managed to lift very heavy weights, whilst remaining slightly built and not having the body type of a weightlifter. Sri Chinmoy said, that it was prayer and meditation which gave him the capacity to lift these heavy weights. Sri Chinmoy, Aspiration-Body, Illumination-Soul Part 2, Agni Press, 1993. People often ask why would a Spiritual Teacher take up the sport of weightlifting. Sri Chinmoy would reply it was not to compete with others, but only to compete with himself in a spirit of self-transcendence. Sri Chinmoy, Aspiration-Body, Illumination-Soul Part 1, Agni Press, 1993. Sri Chinmoy also sought to inspire people; he felt if people got joy from seeing an elderly person lift weights, it would make them happy and inspire them in their own way. For example, well known bodybuilder, Frank Zane spoke how “the guru strengthened his already devout practice of meditation and Buddhist chanting to overcome nervousness and sharpen his confidence in bodybuilding competitions.” (A Monument to Strength as a Path to Enlightenment) at New York Times. To Sri Chinmoy his philosophy was not to use ‘mind over matter’, but to use the strength from within. Before lifting, Sri Chinmoy said he would simply silence the mind and be as concentrated as possible allowing no thought to enter.